Home / News / Warning!!! 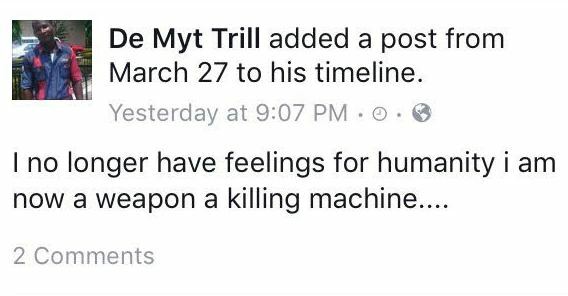 The above person last night reposted an update that said "I NO LONGER HAVE FEELINGS FOR HUMANITY, I AM NOW A WEAPON, A KILLING MACHINE". The fact he reposted it shows how serious he meant those words. I wonder what might have gone wrong in his life. Someone needs to reach out to him, to understand what exactly his problem is. Let us all be careful.